Lucy, Lucy, Lucy what a shame that you didn’t have a better start in life. 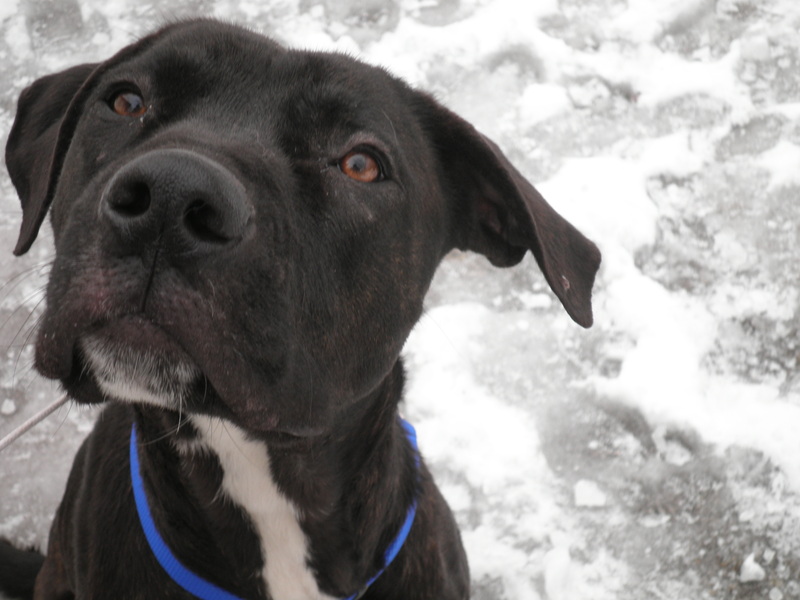 Lucy is a 1 year old Boxer Mix that must have missed out on being socialized when she was a puppy. She is very fearful of new situations, noises, people and dogs. Unfortunately, lately she has been acting out on this fear by growling and snapping at people and other dogs. Once she knows you and feels safe, Lucy is a love bug. She will even play very nicely with other dogs that she knows.She is a rescue dog that is currently being saved by Michigan Animal Adoption Network. Lucy didn’t do very well at the last two pet adoptions. She was growling and lunging at other dogs and even snapped at one of the rescue volunteers. The big question is what to do with her? I had met Lucy several months ago at the kennel that has so graciously donated a place for her to stay. At that time she was about 11 months and just a wild puppy with no manners. I noticed that she was a little fearful, stubborn and just a wild untrained puppy. As stated earlier she is now acting aggressive in certain situations, so I decided to take put her into Bonny’s Bootcamp. Initially I didn’t introduce her to my dogs and simply reworked her obedience skills. Such as walking on a loose leash, Sit- stay etc.. She was a little rusty. 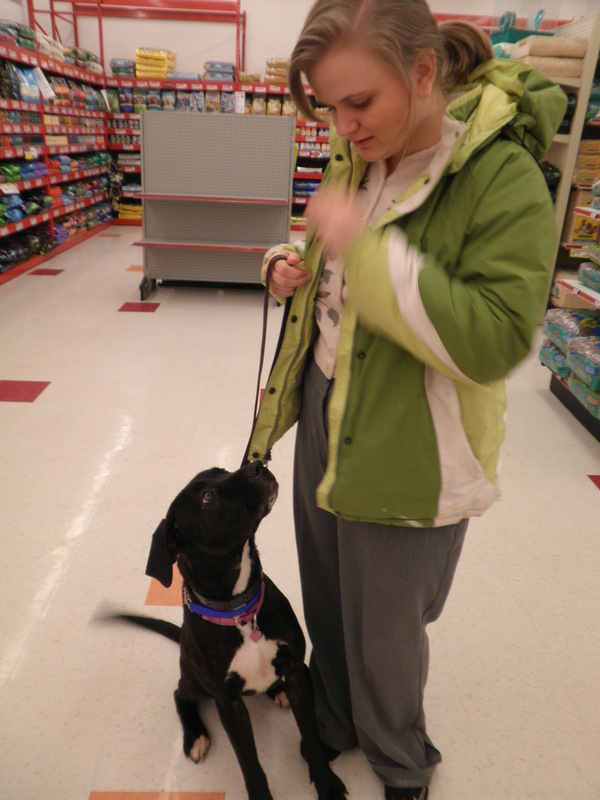 That evening I took her to a group class that we hold at Pet Food and More in Clawson. She did great. I even had my niece work with her. You would have never thought that she was aggressive. I will admit that she did appear to be nervous. Unfortunately, because of her fear and anxiety she developed diarrhea for the next two days. I didn’t take her anywhere, but kept doing little obedience exercises. Even though I really needed to keep taking her to new places, but I didn’t want to create any stress. Worked on her obedience, took her for a walk around the neighborhood and let her play with my dogs. She had a blast playing with my dogs and both of us enjoyed the long walk. No more diarrhea, so time to go places. I first took her to downtown Rochester and she did well. Hanging Out in the City. The next stop was at a pet store and this is where Lucy fell apart. There were many people in the store and one of people who gave her treats really got into her face. It was a man and I have discovered that she is more nervous around men. When this person gave her treats, he put his face 2 inches from her and roughly started petting her. This person also had a beard. She got very nervous, stiffened and emitted a low growl. No lung, just a growl. The problem after that her anxiety level was at its max and the next person that tried to give her a treat. Well she growled and then air snapped. There was no point in trying to socialize her anymore today. We went home. In the morning I took her over Karen Biddinger’s house for a little work on doggy socialization with the dogs at Karen’s house. Lucy was first introduced to Kodi, a Caucasian Shepherd. She growled and tried to lung. After two corrections, she calmed down and would take cookies with him there. Next was to introduce her to Karen’s two Pit Bulls. We placed a muzzle on Lucy and introduced her one at a time. Initially she growled and once corrected was okay with them. While muzzled she was also introduced to a wonderful little poodle. Her first response was again to be nervous and to growl. After corrected she kept trying to get the poodle to play with her. In the evening I took her to a group training class. Lucy did great. 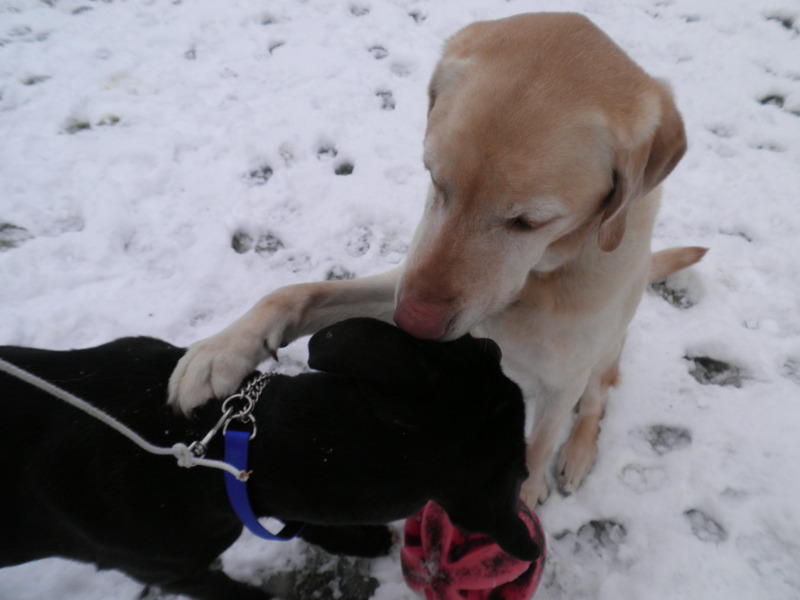 Her first response was again fear and when placed near the other dogs she emitted a very low growl. Again she was corrected and by the end of class wanted to play. 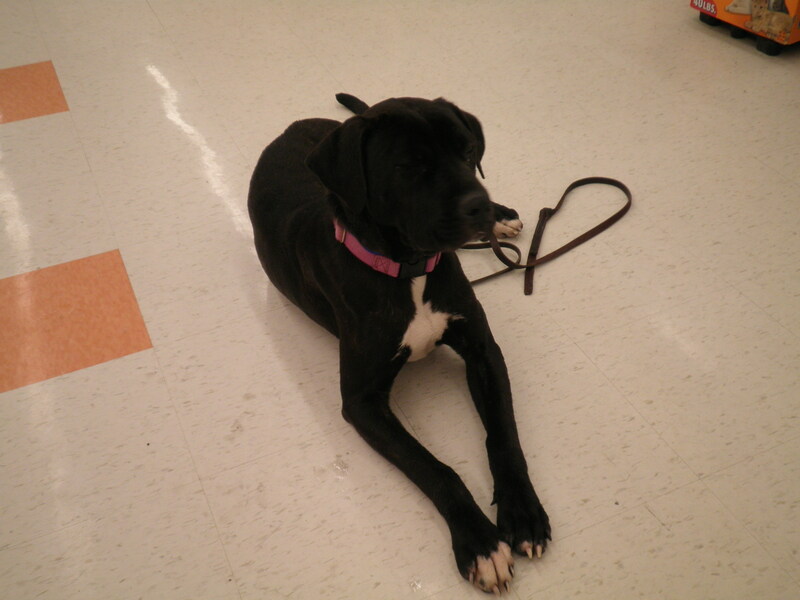 She was also introduced to many people at Pet Food and More. Again at first she was fearful, but by the end of a half hour she was laying in peoples laps to get petted. I have 2 more days to work with her and then I will take her on Saturday to the next pet adoption event at the pet store. It is a shame to see a dog so afraid of anything new. The sad part is that Lucy has so much potential. To see her interact with dogs or people that she gets to know is beautiful. Being a foster dog her life is literally on a thread. My concern is what will happen to her after the training, since she doesn’t have a foster home to go to. After the training Lucy will be going back to the kennel and even though it is a great facility. She will not have the opportunity to be continually exposed to new people, places and other dogs. 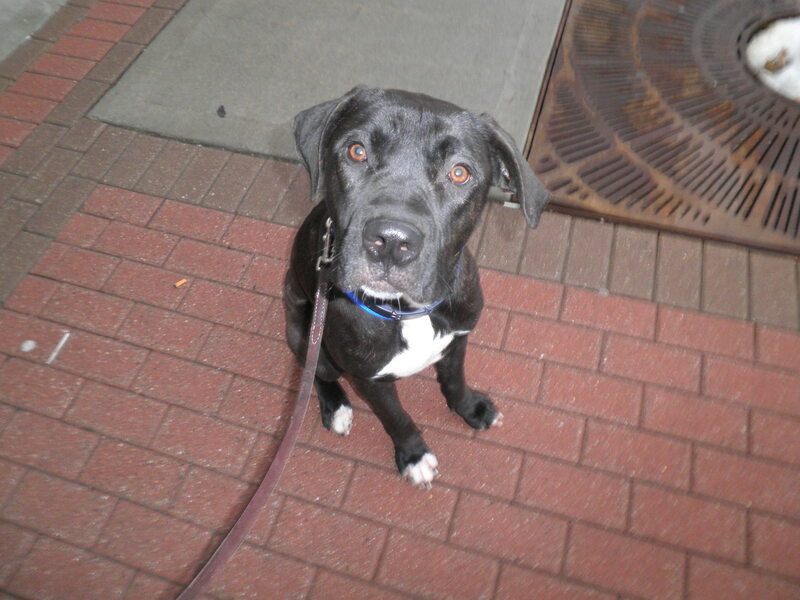 Check out my blog in a couple of days to see how Lucy does at the pet adoption. Entry filed under: aggression, Cautious Dog, dog aggression, Uncategorized. Bonnie, congrats on everything you are doing with Lucy. I hope she will find a home soon. Hopefully you can give me some advice of how to deal with a problem that has arisen with Daytona. She has developed a bad habit of taking food off the counter while we are not home. she took a container of peanut butter cookies and ate the cookies that were left in it. Then she knocked down a plate that had a piece of marble cake on it and ate that. I don’t know what has gotten into her. I should let you know that she is now on phenobarbytal for seizures and is that possibly a cause of her “mental breakdown”? I appreciate any help you can offer. Thanks!! Hope you are doing well and sorry to hear that Daytona has developed a rebellious nature. The medicine could be the reason that she is acting out. it could also be do to boredom. She is getting older and may not be doing as much as she used to. The problem just like us the mind is able, but the body isn’t. i have one client in my group classes that brings her dog to class during the winter just to keep her dog mentally challenged. Why not recommend crate training for when the dog is home alone? I don’t understand why people see crate training as a negative when it really can protect the dog from getting itself into dangerous situations.